Waka Waka Time For Africa Blogger template is two column blogger template with sidebar to its left and post section to its right.The theme is very beautiful and you would be going to like it for sure.Many widgets have been built inside it.Like social bookmarking icons are ready below the posts and rss button for the blog also ready at top of header.Also have an small welcome section at top of sidebar to write about your blog or yourself above sidebar in layout.Seo for title has already been done for you.Top menu links are also ready for you.Search bar is also at sidebar and rss button at top of blog. WakaWaka Time for Africa! Right now the whole world is crazy about football, the World Cup! You can swim in the world of football here. Devote your passion into football after a tiring day for working or learning. Applause, laugh, or whoop! Integrate yourself with the football in this world! This healthy template is compatible with latest WordPress versions and of course, backward compatible. Coming with threaded comments and a couple of other useful settings and tested on major web browsers. Many people have already joined in the football fever, what are you waiting for? Donâ€™t forget to share your watching experiences with other football lovers by this healthy football template. Have fun blogging and watching football games! 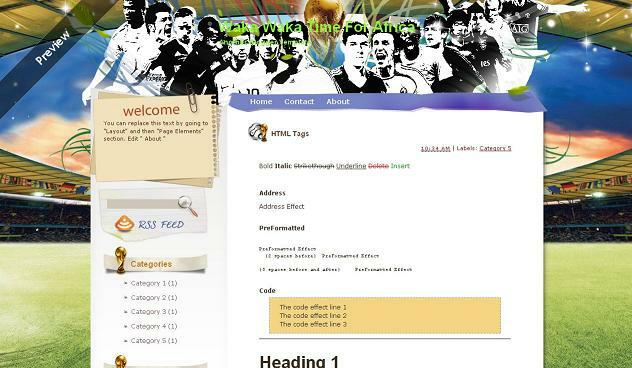 Other blogger templates you may like are Fifa Cup 2010 and Go For Goals.